In 1803, England declares war on France, staking the fates of two mighty empires against one another. Thousands of men serve in the British navy, hungry for distinction in the battle against Bonaparte. I do love some Hornblower and Jack Aubrey, and also some Alex Beecroft and Charlie Cochrane, but let me say right now that Perilous fits in with this company! 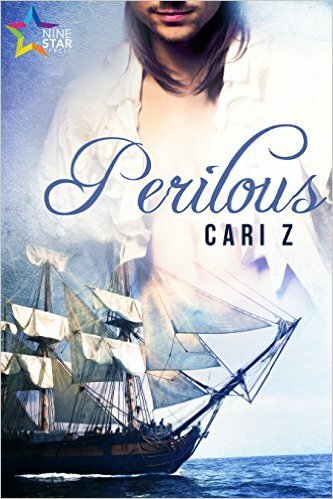 Cari Z gives us a perfectly plausible way to get our two characters together, and to let them have some stolen moments of happiness. While Captain Knightly is aboard, the endless blockade work and the stealthy attacks on the French have panache and derring-do. And the celebrations afterward have to be very, very quiet, because an 18 gun sloop is a very small ship! The penalties for male/male contact in those days were severe, so the captain and his lieutenant had to be extremely careful. When duty to King and family rears its ugly head, Captain Knightly has little choice in obeying. Duty above all, to those in the Royal Navy, and Thomas does his to his lover as best he can. Heartbreaking for both of them. The style will be very familiar to Hornblower readers, descriptive and a little distant. The story has more of what they’re doing than the details of ship-handling, which is fine, I didn’t feel deprived of leewards and starboards and such, I can get that from Patrick O’Brien, who will never ship Aubrey/Maturin like we do. The romance is satisfying, and the ending both heartbreaking and endearing, when happiness is at last in reach.